Starting from upper left is the 6-pin AVR programming header. I chose it because it has +5 and GND as well as the programming signals and can power the board. Next a red LED to show power to the board. Upper right is an LED tied to pin 4 for the default blink ‘hello world’ program. But with so few pins available, a jumper to disconnect the LED for pin 4 in case the application wants that pin. Below it is a reset switch. Next across the bottom are headers, arduino like, bringing out each pin as well as an extra +5 and GND. There never seem to be enough. I also thought it could support a mini shield too. Project info at Larry’s KB7KMO blog. 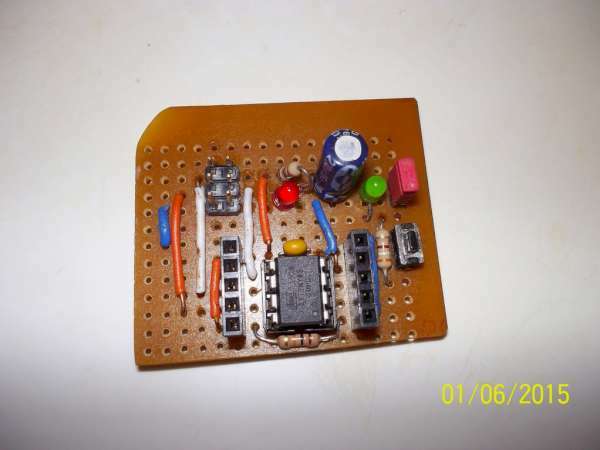 This entry was posted on Wednesday, April 22nd, 2015 at 11:46 pm	and is filed under AVR, DIY. You can follow any responses to this entry through the RSS 2.0 feed. You can skip to the end and leave a response. Pinging is currently not allowed.